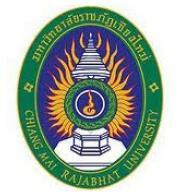 Chiang Mai Rajabhat University is a university in the north of Thailand. It is under the Royal Thai Ministry of Education. The university was founded in 1924 as an agricultural teacher training college. In 1948, it became Chiang Mai Teachers College and offered majors in a variety of subject areas. On February 14, 1982, the year of King Rama IX’s sixtieth birthday, His Majesty proclaimed Thailand’s 36 teacher’s Colleges to be Rajabhat Institutes; they then began offering majors and degree programmes in non-teaching fields. On March 6, 1985, His Majesty the King graciously granted the use of his royal crest as the Rajabhat Institute emblem. Rajabhat Institute Chiang Mai became Chiang Mai Rajabhat University in 2004. Enrolment is about 10,000, and classes are divided into regular, evening and weekends. Most students come from secondary schools in northern Thailand, some even from remote areas. Chiang Mai Rachapbhat University is thus a community institute which provides a comprehensive education for local students and working people. There are five faculties and one graduate school, employing about 500 faculty members. Wieng Boa, the main campus, is on Chang Puek Road, in the center of Chiang Mai. Mae Sa, the campus of Faculty of Management Science, is in Mae Rim District, 10 kilometers from Chiang Mai. Sa Luang (2,320 acres), campus of the Agricultural Center, is in Mae Rim District, 27 kilometers from Chiang Mai. Mae Hong Son campus, in Mae Hong Son, is the center for external services in educational area. By 2013, CMRUIC will be an autonomous body under Chiang Mai Rajabhat University that produces high quality graduates who can work successfully in the workplace through the medium of English to contribute to a well-being of a multi-cultural society.